Why is Jacinda Ardern refusing to defend and promote the Natural Family? Right to Life considers that the election of Jacinda Ardern as our Prime Minister would constitute a threat to the natural family of exclusively one woman and one man. A government orientated toward public welfare and responsible parents, owe it to the next generation to prepare them for natural marriage exclusively between one woman and one man as a family. The electorate has a right and a duty to ensure that they elect only those who are going to defend and promote the natural family and be role models for our children and grandchildren. It is therefore disappointing that Jacinda Ardern is openly cohabitating with a man who is not her husband. Is this the example that we want for our children and grandchildren? 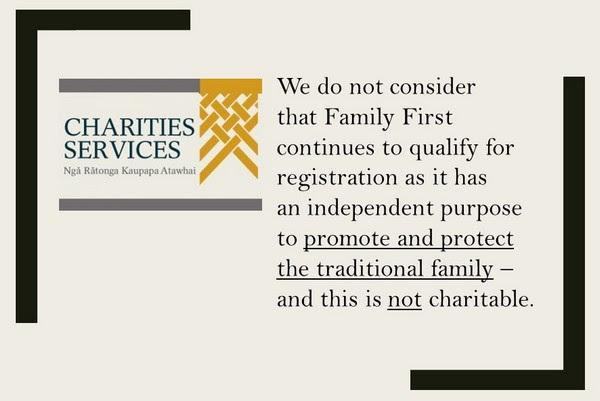 We do not consider that Family First continues to qualify for registration as it has an independent purpose to promote and protect the traditional family-and this is not charitable. The Charities Act 2005 section 5  that a charitable purpose includes every charitable purpose whether it relates to the relief of poverty, the advancement of education or religion, or any other matter beneficial to the community. Right to Life requests that the Charities Commission produce the evidence that the promotion of the traditional family is controversial and does not promote a benefit to all New Zealanders. Is the Commission going to suggest a replacement for the traditional family?